Another quick craft post today. This week we went to a woodland Christmas crafts session run jointly by local family charity FSN and RSPCA Mallydams Wood staff. Here's one of the ideas they had for us to try out. 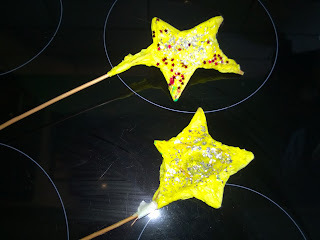 We used it to make wands, but it could just as easily be used for simple stars. For this activity you need long thin sticks - we were provided with willow withies, which you can get from florists and craft suppliers. Bend the stick to snap it, without breaking it off, at four equally spaced intervals along the length. The wider the distance between the snaps, the bigger the star will be. Fold the stick into the shape of a star, with each break making a point of the star. Secure with masking tape (torn in half lengthways to make a thinner tape helps with this). If you didn't want to cover the star, you could add dots of PVA (white) glue at the intersections before you tape it, then remove the tape once dry. To cover, paint PVA (white) glue onto coloured tissue paper and fold around the shape. Our was quite rough and lumpy, but with a bit of practice and patience you could probably get a smoother finish. For a shiny finish, paint all over with more PVA which will dry like a varnish. You could sprinkle with glitter at this point, as we did. The ladies running the group said that you can adapt this easily to make little lanterns for LED candles (obviously not suitable for real tea lights as the lantern would be very flammable). Perfect for little wizards, budding Fairy Godmothers, or even as a tree topper. What should a Christmas Tree look like?